There are many myths that people cling to so strongly that they are accepted as fact – even though there may be little or no scientific evidence supporting them. Protein might have more ill-founded myths surrounding it than any other subject, probably because it plays such a large role in any nutrition program focused on building muscle. Here are three common myths that you’ve probably heard before – but shouldn’t believe. Not only is this myth not rooted in any kind of fact, it is actually a misnomer in and of itself. Absorption refers to the amount of a certain substance that makes it into circulation (plasma) from the digestive tract. The body will absorb a good portion of the protein you eat, regardless of the amount of protein in the meal. In fact, if you didn’t “absorb” over a certain amount of protein, whenever you surpassed this amount, you would have massive diarrhea! The human body is extremely effective at absorbing nutrients, and protein is no exception. In most cases, you will absorb darn near all the protein you consume. What people actually really want to ask in most cases is, “What is the dose of protein that maximizes the anabolic response?” Now that’s a good question! Although there is no definitive answer as to the maximum amount of protein that is beneficial at a meal, there is some research out there that is mildly helpful. Leucine is the sole amino acid responsible for triggering the anabolic response, and protein sources have been shown to elicit anabolic responses in proportion to the amount of leucine they contain.1 It appears that consuming approximately 0.02 grams of leucine per pound of bodyweight at a meal will maximize your anabolic response to that protein source.2 So for a 200-pound athlete, you would be shooting for around 4 grams of leucine at a meal. The Real Deal: For a high-leucine protein source like whey (about 12 percent leucine), that would require about 30-35 grams of protein from whey to max-out anabolism. For a source of protein like casein, which has a lower concentration of leucine (8 percent), you’d be looking at closer to 50 grams of protein. The threshold may actually be lower than this, but we know for sure that this level of intake will definitely max-out the anabolic response to a meal. So make sure you pay attention to the leucine content of your protein sources. MYTH #2: Don’t count incomplete protein sources toward your total protein intake. 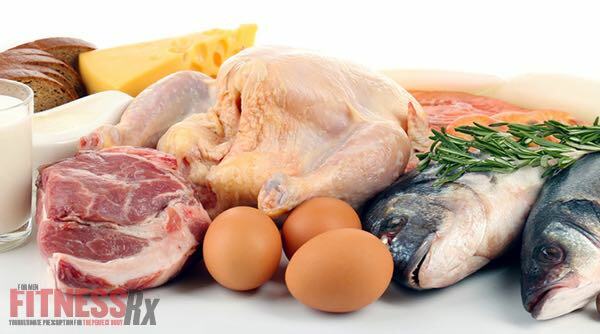 An incomplete protein source is defined as a food that is lacking one or more amino acid. I believe this myth came about in response to research that concluded that when certain amino acids are deficient in the diet, skeletal muscle protein synthesis can be inhibited.3,4 This is very unlikely to be a problem for the typical athlete, as the condition would only manifest itself if he or she ate a diet that was predominantly based upon a certain food that was deficient in an amino acid over a few days, not meal to meal. Additionally, most athletes consume a complete source of protein at almost every meal because any animal product will contain the complete spectrum of amino acids. The Real Deal: Even if one consumed an incomplete protein source at a meal, there is no way a decrease in protein synthesis would occur, so long as a complete protein source was consumed with this meal. One should therefore absolutely count incomplete protein sources toward their total protein intake, since they are consuming the full spectrum of amino acids over the range of their entire diet. Quite a few medical professionals have theorized that a high-protein diet may be hard on the kidneys, since a high-protein diet increases the body’s production of ammonia – which must be excreted by the kidneys as urea. As a result, low-protein diets have typically been recommended to people who suffer from renal disorders. However, the notion that a high-protein diet is hard on the kidneys in a healthy person is a very big stretch. The Real Deal: Researchers who recently conducted a review of the available scientific literature on the subject concluded that “no significant evidence exists for a detrimental effect of high-protein intakes on kidney function in healthy persons.”5 Additionally, a study examining athletes with protein intakes of 2.8 grams per kilogram of bodyweight versus well-trained athletes with moderate protein intakes revealed no significant differences in kidney function between the groups.6 It is therefore reasonable to conclude that a high-protein diet is NOT hard on the kidneys. Agro Food Ind, High-Tech, 2009 Mar/Apr;20(2):54-57. Nutr Metab (Lond), 2005 Sep 20;2:25. Int J Sports Nutr, 2000;10:28-38.